This all started with my farm box…. Again. There was this huge purple cabbage, and I wasn’t sure what to do with it. It happened that my mom is having a burger party this weekend (doesn’t that sound great!?) and she needed a slaw recipe. Anyone who knows me, knows I just don’t do mayo. (Sorry to the mayo lovers out there!) SO I had to come up with something else that would really compliment the flavor of the cabbage. I love the Asian flavors of the fresh ginger, garlic, cilantro and sesame. And then the sweet acid from the rice wine vinegar wakes everything up. I added the carrots for color and sweetness and the green onions and cilantro for freshness. 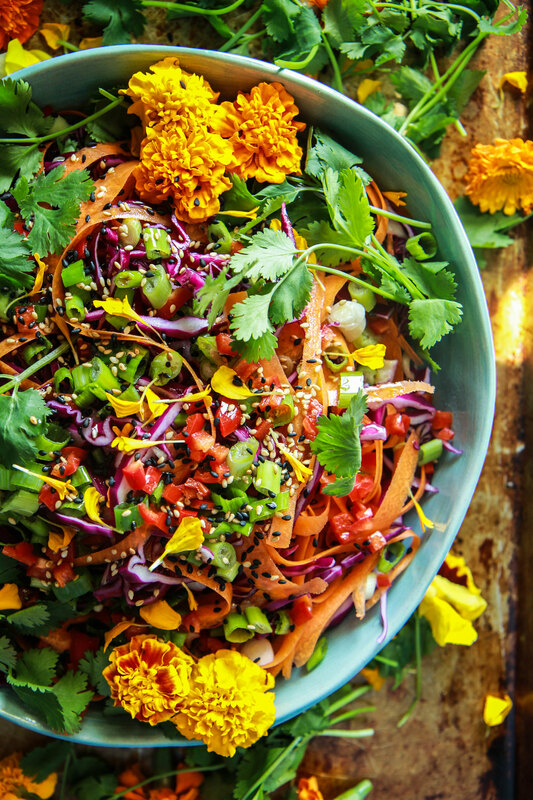 The result is a bold, colorful and healthy salad that is packed with flavor. It has a little spice to it (despite using a whole chili- so if you want more go for a hotter chili or add more) and is very versatile. Serve it with burgers, or as a bed for roasted salmon like I did last night! Finely shred the cabbage, throwing away the tough core. Set aside. Peel the carrots into long thin ribbons with a carrot peeler. Thinly slice the green onions, white and green parts. Run your knife through the cilantro a few times, just to bite sized pieces. Mix all of these ingredients together in a bowl and set aside. Mince the fresno chili, keeping all of the seeds and veins. Mince the ginger and the garlic and the cilantro add it to the chili in a small bowl. Add the oil and the vinegar to the dressing, and stir to combine. Pour the dressing over the vegetables, and toss everything to combine. This can be made and refrigerated for up to several hours, the cabbage is so sturdy, that nothing will wilt. Before serving, add the toasted sesame seeds. This is the most amazing slaw I have ever eaten!!!!! The complexity of flavor is like a party in your mouth! This, on the Asian Pork burgers with all the rest of the accouterments is just fabulous! This will definitely become a family tradition. p.s. Oh oh oh…. the Siracha Lime Cream Sauce… incredible!!! And the pickled onions!!!! My kids were drinking the juice! Awesome Cid!! thank you so much! 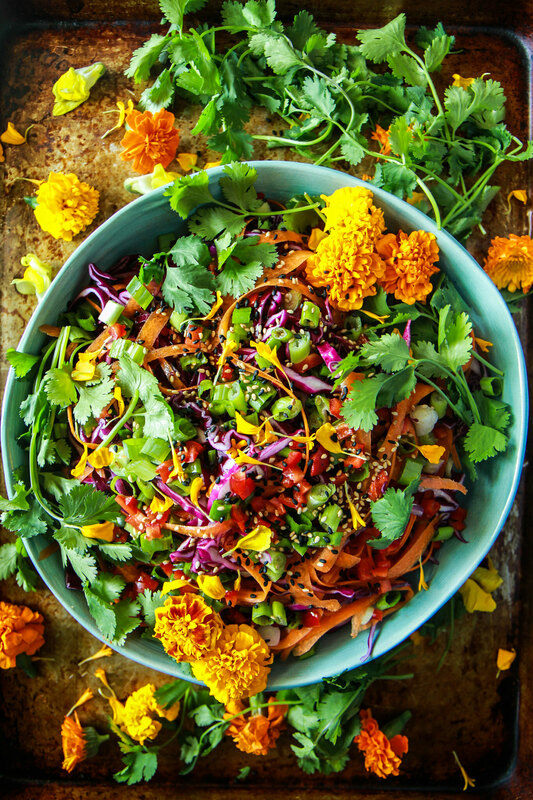 It would be nice if I could print this recipe for Asian Slaw! I just fixed it Celeste!